For more than 10 years, Glad2BHome has been introducing homeowners to local businesses. With Cents of Community we cover all of the bases making sure homeowners know you are part of the community and giving them a reason to walk through your door and to keep coming back. Periodic additional exclusive offers and promotions from you, our participating sponsors, as well as periodic special prizes from Glad2BHome. Most importantly, savings on the products and services they need or want. Most importantly, our Sponsors can anticipate an increase in NEW and RECURRING business. All This for One Low Fixed Fee! 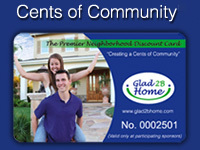 For more information, contact us at info@glad2bhome.com.